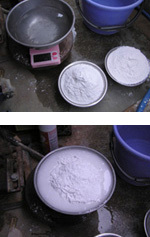 An accurate type can be made only from the pour of gypsum. Fix the casting boards into the groove out of prototype surroundings and with clay prevent a leakage. Enlarge the height of casting board by about 10cm more than prototype height. The material of Wacita (20cm in width about 60cm in length) one zonal is a vinyl chloride or an acrylic fiber. You might decide the size before make a prototype, fix into the pate with groove once, stop with the clip and the packing tape, etc, and make it to the form of a cylinder. Pour about 4cm of the prototype on. If the thickness of the bottom is decreased, the hole is wide by wear-out. Weigh gypsum, and calculate the amount of necessary water. Prepare the water of a necessary amount, and put gypsum in that.Wait until the bubble doesn't occur, and mix it so that the bubble should not enter. The　wheel has been rotated in low speed for 30 minutes until gypsum stiffens. When the wheel has inclined, the liquid level inclines, and the bottom becomes not horizontal. If the wheel is left rotated in low speed, the liquid level becomes the horizontal. And nsert a horizontal stick in a center axis before gypsum stiffens completely, rotate the wheel, and cut down the bottom of the gypsum mold horizontally. 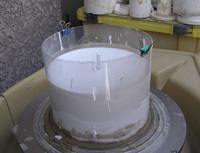 Ｉn the FP wheel, a center axis is being cast beforehand by the gypsum mold. Big advantage to be able to arrange at center of wheel accurately only by reversing gypsum mold up and down as it is. Gypsum is detached from a center axis. The clay blocked internally is taken out. Confirm whether there is bias in the mouth edge. Reasons why there is bias on the mouth of the mold are that the bottom of the mold is not the horizontal. the clay was taken out. The hole of a center axis remains. It is a point this hole's becoming the axis of positioning when turn over. The thickness of the work is decided by moving part D.
a: It is a cutting to make the mound. Part E is a part where the gypsum mold touches the type board. Because it is easy to be worn out, matche it with the surpace of bar. 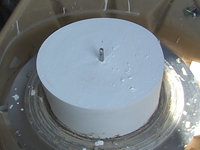 Turn over the gypsum mold, and make the hole for the stopper from a center axis for the position at 20mm. The jig is used in figure. The type board is installed in the trowing tool. Fix it by Tucker so as not to shift. It is also possible to strike with a small nail. The gypsum mold is arranged in a center axis, the grinding tool is supported with a horizontal stick, and the type is corrected. The position with the type doesn't change if the type board is installed in the throwing tool once, and the adjustment is unnecessary after that.